Sand running is an effective training tool for improving strength, speed, agility and balance. The unstable surface adds resistance between your feet and the ground, requiring greater proprioception and stabilization with every step. Athletes can benefit from sand training because the added challenge of running with ground contact resistance strengthens the lower body, helping to improve speed and explosiveness, while reducing the risk of injury. Running in the sand can be made sport-specific using multi-directional drill work that emphasizes agility and promotes athleticism. As described below, the Texas Rangers have used sand training as an off-season alternative for conditioning. Warm-Up. With sand training, the purpose of the warm-up should be to prepare the joints and muscles of the trunk, hips, and lower leg for the demands of increased range of motion (ROM). Because of the soft surface, the joint stabilizing muscles of the legs and trunk are continually active, compensating and engaging with every movement. The result is an increased joint ROM compared to flat ground running, specifically in the feet and ankles. Light jogging, shuffling, and backward running help to get players moving and build a comfort level on the soft surface. After the general warm-up, performing directional lunges and body weight squats will help mobilize the hips and trunk in all three movement planes. Lastly, running mechanics drills, A-B-C march-to-skip progressions, and light bounding exercises can be added to form a bridge from the dynamic warm-up into sprints, agility drills, and plyometric exercises. Speed Training. 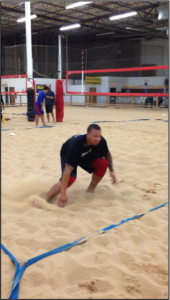 A variety of speed drills can be performed in the sand. We treat speed as “Quality Work, Not Quantity Work” to be performed before resistance training and metabolic conditioning. Fatigue is the enemy of performance, and in technical work, like speed and agility drills, excessive fatigue can have a negative impact on movement patterns very quickly. Fatigue is amplified in the sand due to the soft unstable surface. With sprints and agility drills, pulling each leg out of the sand in stride becomes more taxing, thus adding to the development of knee drive. The unstable surface requires players to sense their position and feel for the ground (proprioception) while planting and cutting. The outcome is that the ideal 45 degree body angle is achieved more easily when accelerating on sand, as players are trained to create positive shin angles to propel the body forward. Plyometrics. Sand provides a soft-landing surface making it ideal for reducing stresses on the joints with plyometrics. However, sand is not the ideal surface for creating a high intensity plyometric response. The sand sliding beneath the feet while jumping and landing makes it difficult to create maximal propulsion. Therefore, there are trade-offs that a coach must be aware of when performing speed and plyometric training on sand with athletes. In performing a countermovement jump, the soft sand makes it difficult for the feet and ankles to push upward at take-off. This results in the feet and ankles shifting backwards in an attempt to maximize power production3,4. To compensate, the hips and upper body must continue to create upward propulsion, and do so by bracing the core for internal stability, forcing the hips into a greater range of extension, and relying more on the force created by the arm swing. The increases in hip extension suggest that the hamstrings and gluteal muscles are required to perform more explosively and through a greater ROM on sand than when jumping on a solid surface3,4. In addition, the extra work of jumping in the sand lengthens the amortization phase of the stretch shortening cycle (SSC), possibly resulting in reduced explosive power and performance. To avoid SSC related losses in performance, we view sand plyometrics as a better fit for building a foundation of strength, developing proprioception, and preparing the muscles and tendons of the lower legs before beginning more reactive plyometrics on harder surfaces. 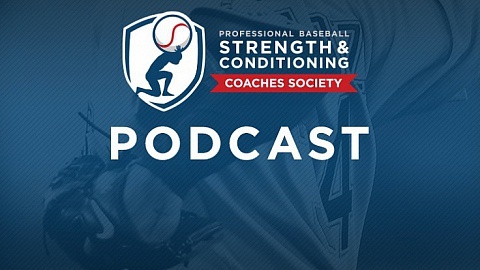 Volume and Programming for Baseball. Training in the sand can have tremendous benefits to athletes as long as coaches understand the stimulus is not the same as running on hard ground. Soft sand absorbs 100 percent of the force applied to it and returns very little of the force back. Every stride requires more muscular strength to pull your legs and body out of the sand. This results in a 1.15-2.5 times greater mechanical workload, and a 1.6-2.7 times greater metabolic energy cost than on stable surfaces1. Phosphocreatine and ATP stores are depleted at a higher rate, and lactate accumulation is 2-3 times greater running on sand as compared to grass2. Because of the higher energy cost and substrate depletion, coaches should use caution to avoid overworking players with high volume sand workouts. 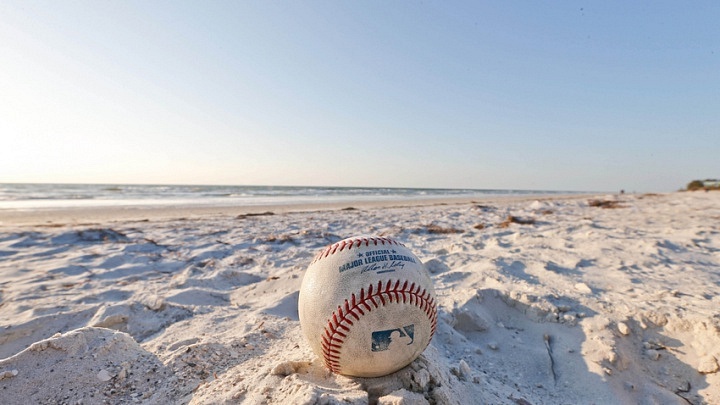 For baseball, sand workouts are likely a better fit for the early off-season months before high-end explosive strength and baseball skill work become the focus. Conclusion. Anyone who has walked along the beach or played a game of beach volleyball can attest to the increased challenge of moving in the sand. With a low risk of injury, sand training is a productive and metabolically challenging workout for running, agility drills, and plyometrics. Workouts are very demanding, and are great for the development of the calf muscles, ankles, and feet. Sand workouts also promote hamstring development and hip extension strength. Coaches should consider the workload demands of their sport when choosing the appropriate training phase to implement sand workouts. Lejeune, T.M., Willems, P.A., and Heglund, N.C. (1998). Mechanics and Energetics of Human Locomotion on Sand. J Exp Biol, 201: 2071-2080. Pinnington, H.C., and Dawson, B. (2001). The Energy Cost of Running on Grass Compared to Soft Dry Beach Sand. J Sci and Med in Sport, 4(4): 416-430. 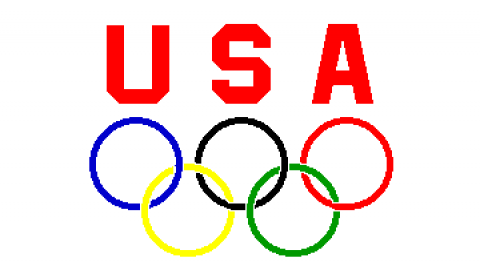 Smith, R. Movement in the Sand: Training Implications for Beach Volleyball, Lincoln, NE: Performance Conditioning for Volleyball, Volume 12(1): 6-8. Smith, R. (2006). Movement in the Sand: Training Implications for Beach Volleyball. Strength and Cond Journal, 28(5): 19-21. Eric McMahon, M.Ed., CSCS, RSCC*D is the Assistant Strength and Conditioning Coordinator and Round Rock Express Strength and Conditioning Coach for Texas Rangers Baseball.